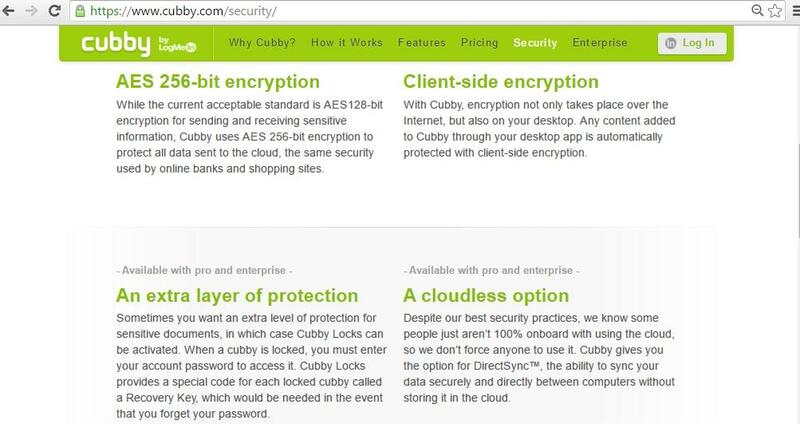 Cubby: Is It a Better Cloud Storage? After Google Drive, Dropbox, Microsoft SkyDrive, SugarSync, now its Cubby with another application of Cloud Storage. It has to boast a good number of advanced features and benefits. Check out if you find it better than the ones you were using so far. 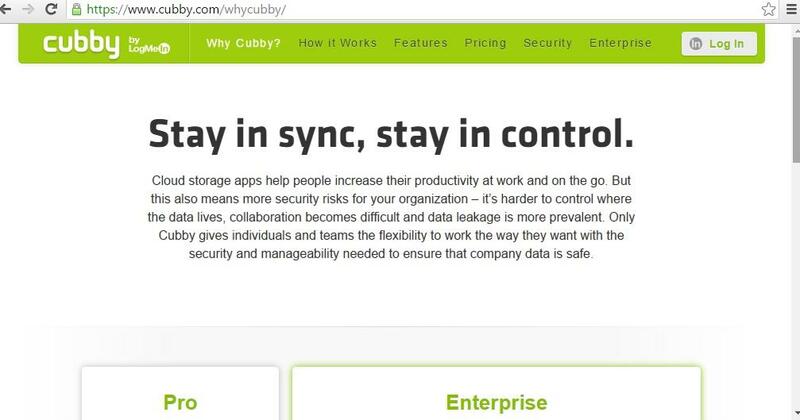 After getting used to Google Drive, Dropbox, SugarSync, Box, and Microsoft SkyDrive, the introduction of Cubby might raise the question, "what more?" To answer, Cubby says, "Your digital happy place," as their mission statement. And to justify their mission, Cubby has moved way ahead from the standard folder-syncing services with few latest high end features that could keep it ahead of its early competitors. It has a DirectSync feature which is a tool to synchronize between all the data of separate computers without occupying space on its servers. But right now to avail this feature you need to go for the paid package which they call it Pro accounts. What I found interesting in the list of Cubby features is that it is not unnecessarily long and having irrelevant subtopics. On the contrary Cubby appeared to be quite realistic and down to earth service keeping simplicity as their top priority. Here I have listed down the features that Cubby has to offer. Cubby follows the standard syncing service as the rest of the lot which is now unlimited for all users. 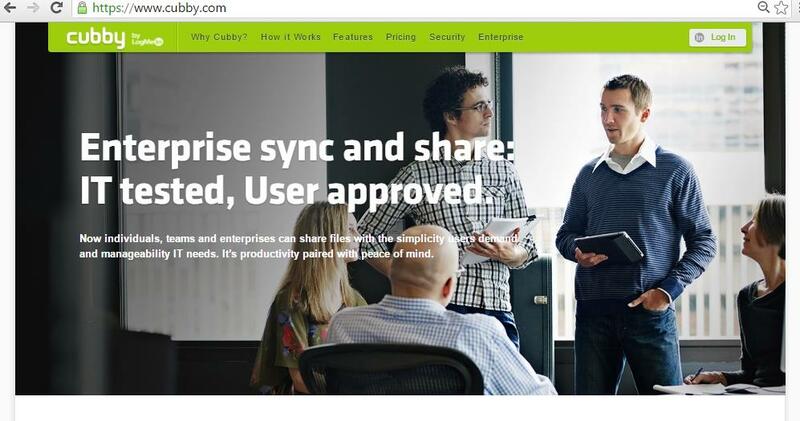 DirectSync stands as the most attracting feature of Cubby which gives the benefit of syncing up unlimited number of files and folders across various computers without banking upon the cloud storage space on the servers. Moreover whenever there is any change made to a computer, it will automatically be synchronized through the entire network of Cubby, as well as with other computers. And the best part of it is that, the storage would be existing only on the computers instead of the cloud. As we get in Dropbox or Google Drive, in Cubby too sharing your files or folders with public share links is easy. Cubby allows People to see only what you choose to share and download, not anything inside that has been edited within your Cubby account or whatever you wish to keep it private. To make the circle complete Private sharing too has to be there as others, and here it is accessible only within the group of Cubby users, to ensure safe sharing of files and folders within the close knit group of your family and friends. What more? The files and folders that you share privately will be automatically synced to all the contacts with whom you have shared. This is one feature of Cubby for which it can boast and stand ahead of others. While in Google Drive you get only 100 revisions, SugarSync giving only 5 earlier versions and Dropbox though allowing unlimited asks you money for it, Cubby keeps all the versions of your files safe and does it free of cost. In Cubby they provide you with a handful of user-held encryption keys, that adds up an extra level of security for the files and folders you create. Here you would be given an option to store up your files into a lockbox where only you will have the access to unlock it. Before sharing your stuff in Cubby, what you need to do is unlock them and do the rest. 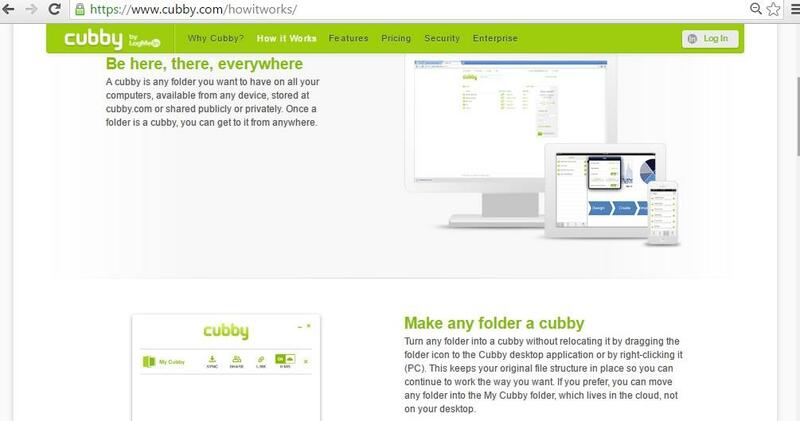 Cubby works with Windows and Mac and Mobile Apps. It has its apps running on Android and iOS platforms as well. The Web Uploading system however isn't much breeze in Cubby. The web app allows to upload files only one by one. They have not included any option for bulk uploading, neither you can ease your work with the simple drag and drop process. Moreover the given limit for file size to upload on web is only 2GB, which though might be sufficient for individual users but not for a corporate workstation. Once you log in, you can immediately start adding your cubbies by dragging-n-dropping your files and folders into the desktop app. There is a "Create cubby" button, where you can create a new Cubby. But one loophole that might annoy you is that they don't allow you to add sub-cubbies, but as an alternative you can add sub-folders into a folder which a cubby stands for and that sub-folder will be automatically synced. To use the DirectSync option for a file or folder that has been synced onto the cloud earlier, one has to turn off the cloud option. Once they do it the app will automatically switch to the DirectSync for the Pro version account users. This works fast and those who are on the Basic account can choose to configure DirectSync separately. Cubby can be used free of cost for the Basic package and the users can "Sync and store with simple cloud access" with 5GB Free. But here the package is available for Single user. One can simply download the app and start making use of it. Then there is this Pro, where again one can have the Sync, with sharing and storing feature enabled the other premium features include the DirectSync, Unlimited versioning and file size uploads, Private and public sharing, Desktop and mobile apps (Windows, Mac, iOS, Android), Cubby Locks (user-held encryption keys), Device wipe and Client-side encryption (AES 256-bit encryption). Even this pack is for Single users. Right now they will give you an Introductory offer of $3.99 per month. The Reg. price is $6.99 per month, which can be pre-paid annually. The Enterprise is the package for multiple users who enjoy the features like "Manage users and company data with enhanced security". They are free to share 1TB of data by paying an amount of $39.99 per month. Cubby is an easy to use cloud storage app that has given its competitors a hard challenge to fight. The app is simple yet multi functional. The best part of the app is that it gives you unlimited syncing and versioning without occupying the cloud server space. The app gives ample opportunity for the Free users which makes it stand ahead of others. The fact that it doesn't allow you to upload on the web in a bulk is a big disadvantage. As it allows to upload files one by one, it becomes time consuming and annoying. The lack of drag and drop option in this too makes it all difficult to perform the web uploading task. Cubby is still growing and has a lot of scope to work better in its own way. Overall it was a pleasure to work with Cubby. The designs were pretty neat and clean both for web and desktop apps with a lot of clarity and easy of use. Cubby came out to be quite flexible in manner where syncing went all easy. It is a nice combination of the best taken from Dropbox and SugarSync. To sum up, its DirectSync option could really pose a threat to its rival apps till they don't adopt the same feature in their Cloud Storage Boxes. Know the top 5 cloud storage services that provide online data backup as well as sync facility with high grade security. Read about these cloud storage services which have excellent services and customer support and are ready to give all the help you need to make your data secure from the dangers of hardware storage devices. Get free upgrade from 7 GB to 25 GB at SkyDrive, don't miss it. Are you enjoying the 7GB free storage at Microsoft SkyDrive? How about upgrading it to 25GB for free? Learn more about how to upgrade your Microsoft SkyDrive from 7GB free storage to 25GB. Drop box is one of the most popular tools available today for online file saving and syncing, and is just a minor step towards full-scale cloud computing. Clubby is indeed a good option when it comes to cloud sharing services on offer. The 5 GB storage space impressive enough. Though the service is quite new and lesser known in the face of biggies like DropBox or Google Drive, it does have the ability to surpass them. The feature set is an indication to it. Thanks for introducing such a great cloud service to us.